The North Face says:"Combining an ultralight DWR-coated shell fabric with 800 water resistant fill goose down, the Quince Pro delivers featherweight compressible warmth, perfect as a mid or outer layer." With winter fast approaching I was excited when I got the opportunity to test out the Quince Pro Insulating Jacket from The North Face. I am 5ft 11, 14st and pretty fit and The North Face Quince Pro Insulating Jacket XL fitted me well while allowing generous freedom of movement. I could easily raise my arms above my head without stretching the fabric or exposing my wrists. The sleeves are a good length and have elasticated cuffs that are not too tight - which is fortunate because they are not adjustable. The front zip is single way, connecting at the bottom and zipping-up only. This zip also has a small insulated baffle behind it to stop the zip becoming a cold spot and this worked well. The hood is snug and fitted well round my head and face but there is no room for a bike, ski or climbing helmet and, like the cuffs, is not adjustable. There are two zipped hand warming pockets on the outside but sadly these are positioned so that they are covered by a rucksack/backpack belt making access very awkward. Inside the two pockets are cinch cords that tighten the bottom 'skirt' of the jacket so that it can fit nice and snug which is a nice feature. This 'skirt' can be easily loosened again by squeezing the locking toggles and adjusted until it is just right. The left hand pocket also serves as a stuff sack and the whole jacket can be easily compressed into it. The left hand pocket zip has a toggle ring on both sides to facillitate this - but bizarrely there is only a toggle cord on the outside so zipping the pocket shut with the jacket inside is a little tricky but do-able. The North Face Quince Pro weighs just 360g (12.7 ounces) and stuffs down to the size of a small loaf of bread so finding room for it in your daypack/backpack is easy. Getting the jacket back out of the compression pocket is simple enough and it does not appear to suffer from any problems from being so compressed, springing back into shape instantly. The insulation used comprises the highest quality Hungarian goose and has a fill power of 800+. This fill power is an indicator of two important features: warmth-to-weight ratio and compressibility. 800+ Fill Power means that 1 ounce (28.3g) of down fills a volume of 800+ cubic inches (14.7+ litres). For The North Face this is the 2nd best fill power available - 900 Fill Power being the highest. To hold the insulation in place, The North Face Quince Pro Insulating Jacket adopts the common stitch-through construction technique. This method traps the insulation in a series of rows so it doesn't all fall to the bottom. The front has a lining as well trapping a layer of air between it and the insulation for added warmth. In use (see below) I was unaware of any cold spots developing where the insulating rows met - no doubt due to the superb warmth properties of the goose down. To test the warmth properties of The North Face Quince Pro Insulating Jacket I tried it in a number of different configurations on a cold November day (2°C - 3°C) in The Howgill Fells in Cumbria. Firstly, I wore it over a single, wicking base layer as I started my first ascent of the day. It kept me nice and warm on the lower slopes but as I climbed further and started to warm up and sweat I found I had to unzip it and finally remove it altogether and put on a weather resistant shell jacket. However, it was only when I removed the jacket that I realised just how cold the wind was and what a good job The North Face Quince Pro had done to resist it. Once on the summit I stopped for essential sustenance (aka a chocolate treat & coffee from my flask) and put The North Face Quince Pro on over the top of my shell. Again, I stayed nice and warm and could relax in the biting wind despite it now being below freezing. I then wore The North Face Quince Pro as a mid-layer between my base layer and outer shell for the descent. This configuration seemed to me to offer the most comfort with the outer shell keeping me dry from the now falling rain and The North Face Quince Pro keeping me toastie warm as I picked my way down steep wet grassy slopes. Finally a word about the outer fabric. This is made from 100% nylon ripstop (which means even if it gets snagged on a bramble or barbed wire fence, the hole won't develop into a gaping tear) and has a DWR (durable water repellent) finish - a coating that is added to the fabric at the factory to make it water resistant. But it is only water resistant. Under prolonged rain, the jacket will 'wet out' and water will soak through to the goose down. Now the goose down in The North Face Quince Pro Insulating Jacket has been treated with a hydrophobic co​a​ting and can cope with being wet around 10 times better than ordinary down. So it will still keep you warm under prolonged rain but will eventually become wet. And once wet, goose down does not perform anything like it does when it is dry. Furthermore, it takes an absolute age to dry out so a separate weatherproof outer shell jacket is essential if heavy rain is forecast. At £220.00 SRP, there are definitely cheaper options available if you are looking for a good insulation layer. 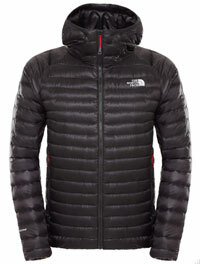 However, the North Face Quince Pro Insulating Jacket offers a very, very warm, 800+ Power Fill goose down insulation. It compresses well and is easy to pack and carry. More importantly it will keep you warm when you need it. If you regularly walk and hike in the winter months in the UK a jacket of this sort of quality is an essential item of kit and you should be beware of cheaper imitations. Incidentally, we got our North Face Quince Pro Insulating Jacket test sample from http://www.e-outdoor.co.uk/brands/the_north_face.aspx who provided a prompt, efficient and reliable service with a smile. Check them out for this or any other item of walking and hiking gear - you might just save yourself more than a few quid into the bargain.